"High-protein, organic cookies for the paleo connoisseur." Combine almond flour, dates, cherries, walnuts, chia seeds, baking soda, and sea salt in a large bowl; whisk to blend. Add coconut oil, egg, maple syrup, and vanilla extract; blend well with a spoon or fork until dough comes together. Scoop dough onto prepared baking sheets with a small cookie scoop. Bake in the preheated oven until edges are golden, about 15 minutes. Turn off oven and let cookies sit with oven door closed, about 10 minutes more. Remove from oven and let cool. 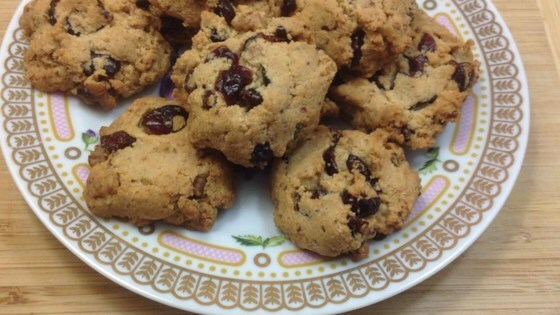 Use dates and dried cherries with no sugar added. Omit maple syrup for the Paleo or "Whole 30" version of these cookies. Followed the recipe as written. These turned out very moist and delicious! I brought them to work and my coworkers raved over them and asked for the recipe. I have been looking for a recipe like this for years - and finely found it. This recipe is flexible, allows easily for substitutions. Thanks for posting and enjoy!